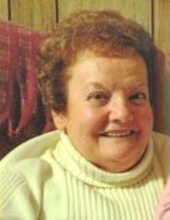 Bernice T. Bergeron 85, of Moosup, beloved wife of the late Cyprien Bergeron passed away March 25, 2019 at Davis Place in Danielson. She was born June 5, 1933 in Wauregan a daughter of the late Edgar and Stella (Larose) Cusson and had resided in Moosup for many years. Mrs. Bergeron was employed in many clerical positions for various local companies. She leaves a son and daughter in law Andrew C. and Nicole Bergeron; grandchildren Riley and Nicholas; a sister and brother in law Vivian and Chuck Colli and their family; stepdaughters Joanne Bergeron and family and Lorraine Deojay and family and stepson Francis Bergeron and family. She was predeceased by her sister Gladys Sears. Funeral and burial are private. In lieu of flowers the family has requested that memorial gifts in Bernice’s memory may be made to Davis Place, thanking them for the fine care she received. Resident Council Fund, C/O Davis Place 111 Westcott Rd. Danielson, CT. 06239. To send flowers or a remembrance gift to the family of Bernice T. Bergeron, please visit our Tribute Store. "Email Address" would like to share the life celebration of Bernice T. Bergeron. Click on the "link" to go to share a favorite memory or leave a condolence message for the family.